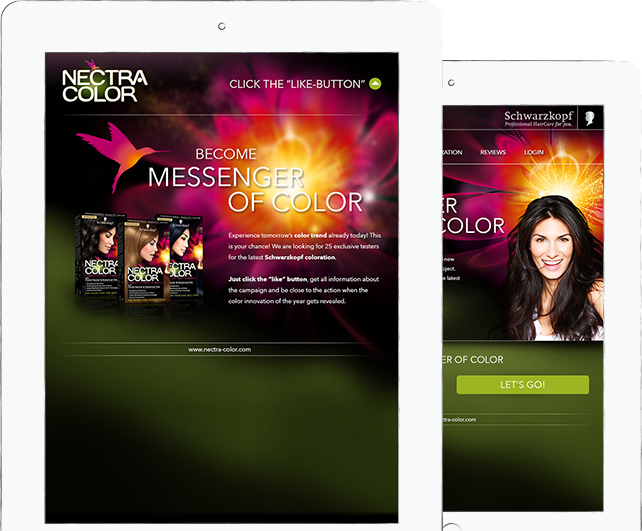 The Messenger of Color from Nectra Color was a Facebook App, based on the „Schwarzkopf VIP Tester“, developed and released in 2014. As Nectra Color was introduced as a new sub brand of Schwarzkopf the same year, Schwarzkopf gave it’s customers the exclusive chance to test their new colorations for free and to then write and publish some reviews about the products. 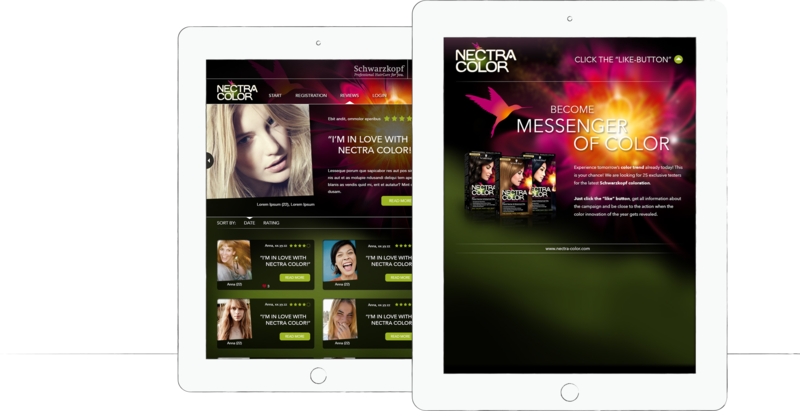 First step to become one of 25 exclusive testers for the Nectra Color products: users just had to like the Facebook page of Schwarzkopf. 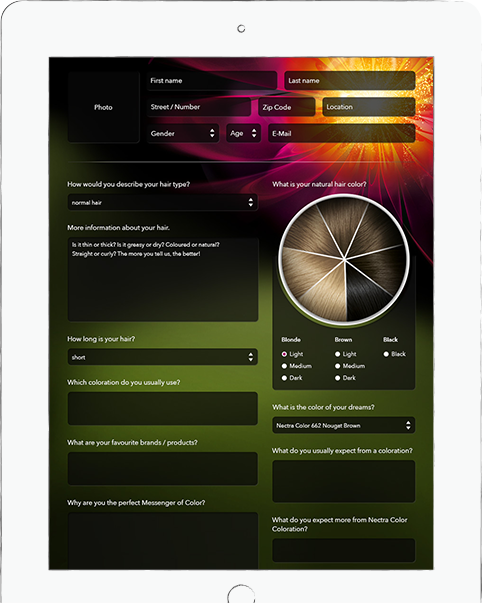 After having liked Schwarzkopf’s Facebook page, all the users had to do was to fill in the registration form, only asking for some personal information and some information on the user’s hair conditions and color favorites. The product reviews – time for the truth! Registered or not – all reviews written had been published for everybody. Next to a list of all reviews, including a profile image, the user’s product rating and a short quote of the user’s review, a big stage with random reviews became part of the reviews overview. The reviews itself contained the user’s rating on the product, it’s profile image, badges of it’s natural hair color and the color he tested, some photos of the color result and, of course, a detailed description of the experience he made with the product. The base of this app, the VIP Tester from Schwarzkopf, was already an existing tool, also created by the company I was working at at that time. So I just had to take the existing tool and create a new look for it which, of course, had to be similar to the brand’s CI and the new website. Thus, I liked the shiny, colorful and natural look of Nectra Color and the website we created, I enjoyed reusing all those elements. Moreover, it was big fun working with the same team again.